Ralph Thrale bought a cottage in West Street, Brighton (or Brighthelmstone as it was then known) in 1755. Brighton was on the south coast, and was a very fashionable town, famed for its sea bathing. 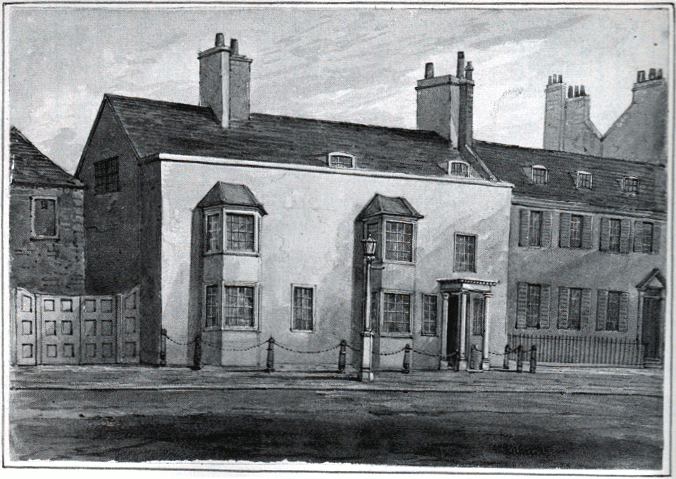 Upon his death, Ralph left the cottage to his son Henry Thrale. Henry loved Brighton for the bathing and hunting on the Sussex Downs. As he grew more affluent he outgrew his father's cottage and needed a larger house to accommodate his servants, family and entertaining. He therefore sold the cottage and bought a larger house on the east side of West Street at number 64. This was a three storey, roomy house with two bay windows and a portico. It was a light-coloured stone structure. It had iron chains dangling from a row of posts in front. It was a very respectable house, despite its proximity to the King's Head. Henry Thrale, also had a pew in the local Church of St. Nicholas. After Henry's death, this house was inherited by his youngest daughter Cecilia Thrale. The property has long since been demolished1 and is now the site of a night club called Creation. Outside the club, a tethering post remains from the Thrale days. 1. Date of demolition is unclear, although it was no later than 1914. 64 or 78 West Street? 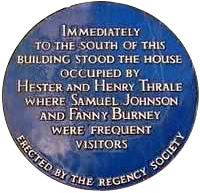 My ancestors lived at 66 West Street in 1850, and I'm told that the Thrale House was 64 West Street - BUT, the Brighton History Centre says the Thrale House was at 78 West Street. Can you tell me the correct address? I have come across a picture of the street on the internet, and just wanted to place our folks' house on the street. I have 64 West Street, but I cannot be sure that this is right. Sorry. I hope that others may be able to help.